Of all the delicious things in the world to eat, crab is easily one of my favourites. It’s got an intense flavour of the sea and it’s succulent, sweet and juicy. In short, it’s fantastic. Preparing crab involves a bit of work and is fairly time consuming… but it’s a labour of love and something I’d urge everyone to try. Cooked in generously seasoned water, the beautiful white meat is excellent whilst still warm, eaten straight from the shell. It hardly needs anything more, although mix it with a little mayonnaise, herbs and lemon juice and you have the beginnings of a delicious salad. I’ve been wanting to write a crab recipe for a while now, but found it difficult to think of a really photogenic looking dish that wasn’t just a rip-off from one of the restaurants I’ve worked in. The custard part of this dish is similar to a crab crème brûlée that we did at Wedgwood, and it’s really tasty. The sweet flavour of crab infuses really well in cream, and the fresh herbs added at the end finish it off beautifully. Fill a large pan with water and bring to the boil. Season generously with salt (it should be almost as salty as the sea.) Drop the crab in the water, bring back to the boil, remove from the heat and allow to cool for at least 40 minutes. Remove the crab from the water, and place on a tray. Break off the claws, and smash them carefully with a hammer or large knife, trying not to smash into too many small pieces. Separate the meat from the shell, trying to keep it in nice big chunks. Repeat the process with the legs. Now prise the body from the main shell of the crab, and remove and discard the lungs (“dead man’s fingers”). Cut the body in half and carefully scrape out the meat with a crab picker or use the handle of a teaspoon. Cut the pieces in half again and scrape more out - you’ll be surprised how much is hidden in all the cavities. Carefully check the crab meat for pieces of shell, cover and place in the fridge. Heat the oven to 200C. Place a roasting tray in the oven until very hot, then add 3-4 tablespoons of vegetable oil. Smash all the crab shell into small pieces with a heavy knife or rolling pin, then place in the roasting tray. Stir once, then return to the oven for 30 minutes, stirring halfway. Meanwhile, thinly slice all the vegetables, keeping the carrots separate. In a large pot, fry the carrots and star anise in a little vegetable oil with a generous pinch of salt, until lightly coloured. Add the rest of the vegetables and sweat over a medium heat for about 20 minutes.The shells should be lightly coloured. Deglaze the tray with the white wine, and reduce until dry. Add the shells to the pot of vegetables, and the tomato, roughly chopped. Add the cream to the pot, and bring to the boil. Simmer gently for 30 minutes, then roughly chop the herbs (reserving some chives and dill for the salad) and add to the pot. Cover with cling film and leave to infuse for 30 minutes. Pass the crab cream through a fine sieve, rinsing the shell pulp with the milk. Discard the pulp. Taste the cream and adjust the seasoning if it needs. Weigh the cream, and then place 1 egg yolk for every 100g of cream in a separate pan. Boil the cream, then pour slowly over the egg yolks, whisking constantly. Now heat the crab custard over a low heat, stirring constantly with a plastic spatula to ensure it doesn’t stick. When it is thick, and coats the back of the spatula (should be 80C), it is ready. Pour into 6 wide crème brûlée dishes, filling only to 2mm deep. You may have some custard left over which you can just set in separate ramekins to be enjoyed on their own. Place the ramekins in the fridge to set, for at least two hours. To make the crab salad: finely slice the lettuce and the spring onion, cut the reserved chives and pick the dill into fronds. 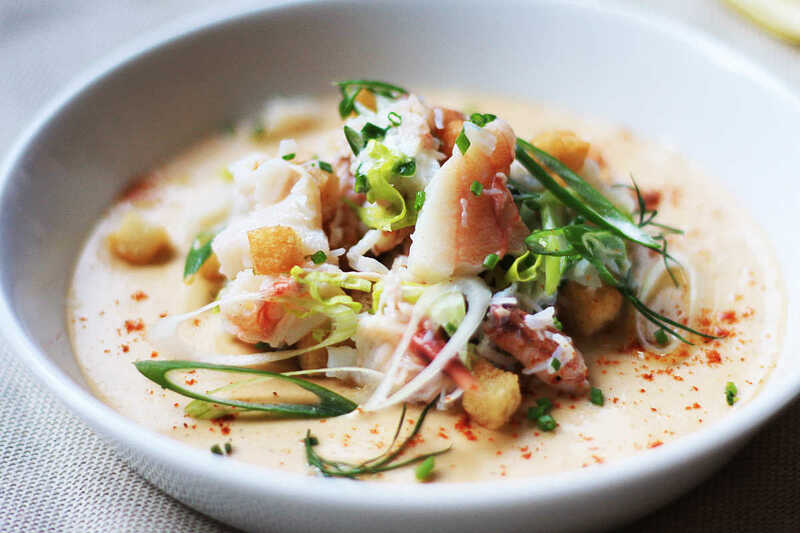 Place everything in a bowl with the picked crab meat, the croutons and add just enough mayonnaise to lightly bind it together; you may not need all of it, it depends on how much crab meat you have. Season with sea salt if it needs, and lemon juice. Divide the mixture into 6 and place in the middle of the custard ramekins. Finally sprinkle over a little cayenne pepper.